Guided by our board of directors, led by an inspired team of employees, and supported by countless volunteers and partners from business, government and our community at large, we are collectively passionate about helping Manitoba youth and their families. While the True North Youth Foundation (TNYF) is a separate entity with its own board of directors, TNYF is interdependent with True North Sports + Entertainment, and shares its Mission, Strategy and Values presented below. Collectively, our sports teams, our employees and venues (Bell MTS Iceplex, Camp Manitou, Bell MTS Place, Burton Cummings Theatre) support a range of activities and wellness programs focused on youth. Thanks to the generosity of donors and supporters of 50/50 and other fundraising initiatives, we are able to reach as many youth as we can in our community. The True North Youth Foundation endeavours to be a valued partner in assisting youth within Manitoba to achieve their full physical, social, emotional and intellectual potential. We further strive to establish ourselves as an integral asset to the City of Winnipeg and Province of Manitoba while striving to be a consistent source of pride for our entire community. We are relentless in our pursuit of providing consistent, innovative, viable, successful programs that provide underserved youth in Manitoba the hand up they need to fulfill their ultimate potential. We fulfill this obligation by providing opportunities in a positive, enlightening environment that will educate youth on how to improve the quality of their lives. In an ever-changing world, we seek to consistently re-invest in our youth, facilities, and programs to enhance opportunities that allow the future of Manitoba to meet their full potential. We envision growth in a fiscally responsible way, by looking for new sources of funding while ensuring we maintain the level of consistent predictable impact on the youth of the Manitoba. Team: Giving priority to the needs of underserved youth of Manitoba, we value the contributions of all staff, donors, stakeholders and youth involved. We realize without the cooperation, passion and commitment of the entire team we could not be making the positive impact of the youth of Manitoba that we are today. 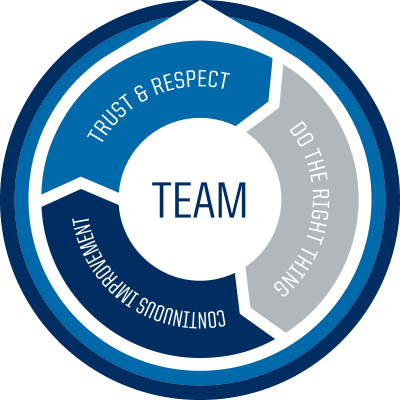 Trust and Respect: Appreciating that everyone and everything has importance to the youth of Manitoba’s success, we seek to grow trust and respect with all stakeholders via continuous communication, consistency, cooperation, integrity and accountability. Do The Right Thing: Balancing the needs of youth experiences, ensure safety of those involved promotes a positive experience for all. We endeavour to Do The Right Thing by demonstrating humility, empathy, honesty, tireless work ethic and a continuous commitment to improve the lives of Manitoba’s youth. Continuous Growth: Never satisfied with the status quo, we value continuous growth by encouraging youth, staff and stakeholders to be innovative in their thinking and action, instill the notion of high expectations and goal setting, and promote intrinsic motivation within the culture and people of the True North Youth Foundation. Learn about the True North Youth Foundation and the work that they do to ignite the potential in our community’s youth.